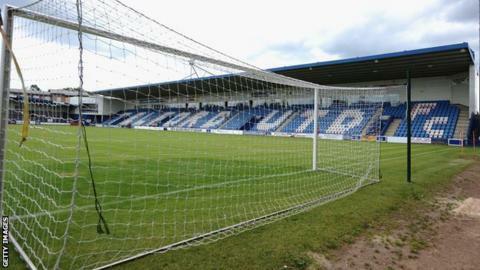 Fan-run AFC Telford United are to consider selling shares in the hope of improving their financial fortunes. The Bucks, bottom of National League North, having won just three times in 18 matches this season, say they need to find new funds to help them compete. The AFC Telford United Supporters Trust, the club's owners, have now opted to consult other Bucks fans. A document entitled 'The Future' has been issued to supporters ahead of the annual general meeting on 26 November. They are hoping enough fans vote for the second of the two options at the AGM, which would permit the club to sell shares to individuals. Supporters Trust chairman Luke Fearnall and club chairman Ian Dosser issued a joint statement, saying: "We are the guardians of the club. As such, we have recognised the shift in the way other clubs are financing themselves in order to compete. This has seen us struggle to keep up. It has led us over the last 12 months to examine and investigate other viable means of ensuring this club's long-term future. "The football club board and the supporters trust board have been meeting as one board to discuss the future structure/ownership. "Both boards recommend the option to sell shares. We believe this offer would appeal to a number of supporters/local businessmen and enable groups of fans to club together to purchase a share." The Shropshire side, formed in 2004 after the old Telford United's liquidation, started their 'new life' in Northern Premier League Division One, taking seven seasons to earn the three promotions needed to get back to where they were, in the top flight of English non-league football. But, since winning promotion to the 'fifth division' for the first time in 2011 under Andy Sinton, doing the same with Liam Watson in 2014, they have struggled to re-establish themselves and have now twice gone down. AFC Telford United are to hold a 'drop-in session' at the club on Thursday for fans to find out more about the club's proposals.